President-elect Barack Obama will hold a news conference today and name Colorado Senator Ken Salazar as Secretary of Interior and former Iowa Gov. Tom Vilsack as Agriculture Secretary. Wwe are mindful that there is a great deal of work to be done at the very beginning of Congress, the very early parts of January, so we'll take all that into consideration. Bump and update: Our local news is reporting Sen. Salazar has been offered and accepted the cabinet position of Secretary of the Interior. 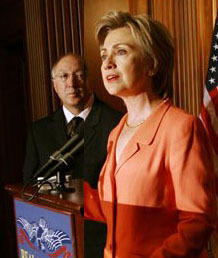 Could Hillary Choose Sen. Ken Salazar as Running Mate? On The Chris Matthews Show this morning, one of the 12 regulars opined that Hillary Clinton's best choice for a runningmate would be Colorado Senator Ken Salazar. Jason Bane provides his analysis over at 5280's Elevated Voices. The show transcript is here.